"O Lord, Thou hast brought me within two hours of eternity, and this is no matter of terror to me, more than if I were to lie down in a bed of roses; nay, through grace to Thy praise, I may say I never had the fear of death since I came to this prison; but from the place where I was taken, I could have gone very composedly to the scaffold. O! how can I contain this, to be within two hours of the crown of glory!" There are 293 Reformation resources under the category "Martyrs and Persecution" on the Puritan Hard Drive. A search for the word "Martyr", using the Master Search index on the Puritan Hard Drive, brings up 24,749 results in 1,051 documents, all of which give you the search term in the context of one line -- and when you click on this line the Puritan Hard Drive opens the correct book, to the correct page, and highlights your search term. Stirring accounts of sacrifice and martyrdom for the Reformed Faith that will bring tears to eyes of all but the most backslidden. Follows the chain of events which gave Scotland two Reformations and a Revolution. John Knox, the National Covenant, The Solemn League and Covenant, the Westminster Assembly, the Field Meetings (conventicles) and the "Killing Times," and much more are all covered. The history of many great battles for Christ and His royal rights are accurately recounted in this moving chronicle of Reformation struggles and martyrdom. These accounts of men, women and children who were willing to die for the truth of Christ's Kingship over all things are as amazing and edifying as any you will ever read! This is one of our best history books, and is highly recommended! It is great for home schooling, history classes and various other learning situations, as it contains convenient review questions at the end of each chapter. Furthermore, it is written in an easy-to-read and engaging style, which makes it one of the best introductions to the Scottish Covenanters and the periods of the first and second Reformations in the British Isles that is available. This book is most commonly known as "Scots Worthies." This full edition contains Howie's footnotes (defending the Covenanters) and Howie's appendix titled "The Judgment and Justice of God" (which chronicles God's judgments upon Reformation apostates and those who persecuted the Covenanters). It is the only edition in print which contains both these sections intended for publication by the author (as later editors often removed either one or both of these parts of this book). An amazing book compiled to show how -- and especially why (from their own dying testimonies) -- the Covenanters suffered, bled and died. All the books and MP3s listed above are on the Puritan Hard Drive. Cerlox bound photocopy (printed) editions of many of the books above are also available at http://www.swrb.com/pcopy/photoc.htm. "So many Protestants, called Huguenots in France, were leaving France under the fiery persecution of the Catholic Church. They were coming to Geneva, really, to save their lives. When they arrived in Geneva, there was John Calvin, teaching the Word of God. He had established a seminary, and according to some reports, he trained 2,000 pastors to go back with the true message of the Gospel, 2,000 preachers to go back into France with the Gospel and the true reformation faith. His seminary became known as, "The seminary of death," because so many of the preachers he trained went back to France and died as martyrs. The seminary of death. Might be a little hard to recruit people to that today. "I was one of those who had profited much from using the plethora of out-of-print Reformation materials offered by Still Waters Revival Books in the 62 CDs (Puritan CDs and Reformation CDs) for a number of years in my ministry -- works that I could only have found in select libraries (usually hundreds of miles away from my residence). - Greg L. Price (Author, Theologian and Covenanted Presbyterian Minister, USA). 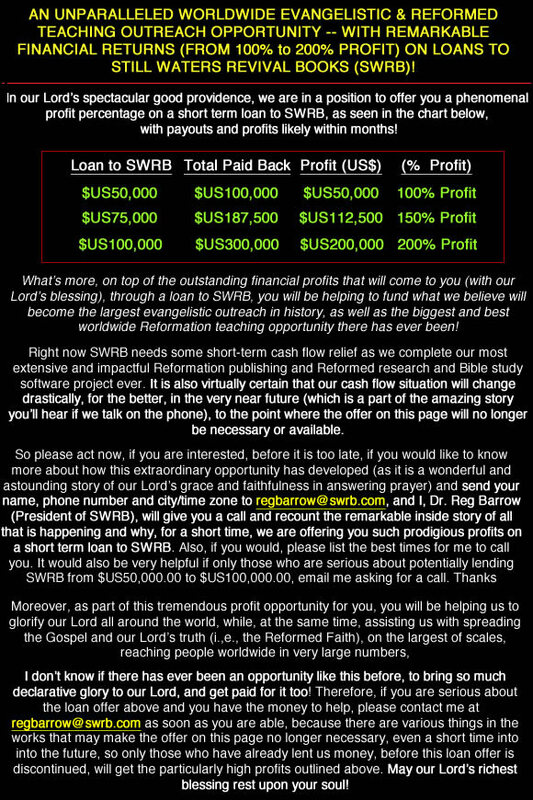 Many free online books, MP3s and videos by Greg Price are at http://www.swrb.com/newslett/freebook/gprice.htm and at http://www.sermonaudio.com/go/61470.